One requirement especially in automotive applications is the diagnosis of failures in functions and systems. Therefore light functions realized with LEDs like break light, daytime running light, low and high beam may require a diagnostics function. 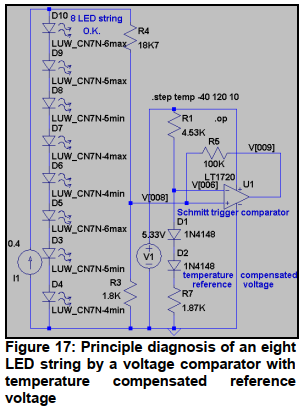 This application note describes some items which have to be taken into account, when a diagnostic function for a LED string or a multi LED module has to be realized. This entry was posted on Sunday, September 30th, 2018 at 1:00 pm	and is filed under app notes. You can follow any responses to this entry through the RSS 2.0 feed. You can skip to the end and leave a response. Pinging is currently not allowed.